The year 1934 saw three historic strikes that transformed U.S. labor. It was the year when the American working class clenched its fists and rose from the depths and humiliation of the Great Depression. Within just two years would come the great Flint Sitdown and the massive strike wave that organized industrial unionism — producing the historic gains that are under attack in today’s capitalist offensive. The left played a critical leading role in all three strikes. The West Coast Waterfront Strike lasted eighty-three days, triggered by sailors and a four-day general strike in San Francisco, with leadership provided by militants of the Communist Party, and led to the unionization of all of the West Coast ports of the United States. The San Francisco General Strike, along with the 1934 Toledo Auto-Lite Strike led by the American Workers Party headed by A.J. Muste, and the Minneapolis Teamsters Strike of 1934 led by the Communist League of America, were important catalysts for the rise of the Congress of Industrial Organizations (CIO). 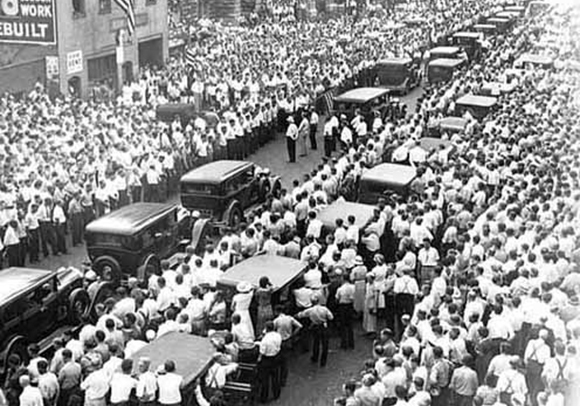 The 1934 mass strike in Minneapolis. A new book by Canadian Marxist historian Bryan Palmer, Revolutionary Teamsters, explores the Minneapolis Teamsters strike with the most detailed account to date of the strategic thinking of Trotskyist militants who organized and led it. A review by Barry Eidlin appears in the July-August 2014 issue of Against the Current. Two other reviews have also appeared, by Dan La Botz on the New Politics website and by Alan Wald in Labour / Le Travail Issue 73, Spring 2014. An 80th anniversary celebration of the historic 1934 Teamsters Strike will be held in Minneapolis on Saturday and Sunday, July 19-20, 2014. July 20 marks the date of a police massacre when 60 strikers were shot in the back, killing two. For information on the commemoration activities, contact the Remember 1934 committee. In 1934, a small group of dissident Communists, followers of Leon Trotsky, led Teamsters Local Union 574 through a series of strikes and emerged victorious, ending the employers’ open-shop regime and making Minneapolis a union town. It was one of three important strikes that year—the other two were in San Francisco and Toledo—that signaled the beginning of the great labor upheaval of the 1930s with its sit-down strikes, mass picketlines, and violent confrontation, leading to the organization under the aegis of the Congress of Industrial Organizations (CIO) of industrial unions in auto, steel, rubber, and the electrical industry as well as in many other branches of the economy. Overall six million workers were organized by the CIO and the AFL in the 1930s, winning workers union protections, raising wages, improving working conditions, gaining respect from foremen and supervisors, and bringing workers a new sense of self-confidence and pride. Only the Civil Rights movement of the 1950s-1960s rivals the 1930s strikes in significance in modern American history. How could a small group of radicals on the fringes of American society in one second-tier city in the Midwest have played such a crucial role in helping to detonate that momentous development in the American labor movement and society? That is the central question Bryan D. Palmer attempts to answer in his Revolutionary Teamsters…read the full review here. Few events loom larger in the history of the U.S. Trotskyist-influenced Left than the Minneapolis truck drivers’ strikes of 1934. While often cited within mainstream labor historiography in conjunction with the San Francisco general strike and Toledo Auto-Lite strike as the opening salvos of the working-class upsurge of the 1930s, the Minneapolis strikes take on an outsized role in the Trotskyist imagination. Here was a case where a movement often forced to struggle at the margins was able to take center stage. While leftists of various stripes have led many working-class struggles, the Minneapolis truckers’ strikes are among the only cases in U.S. labor history where Trotskyists led a major battle. Thus, the Minneapolis truckers’ strikes serve as a touchstone for what appears possible when Trotskyists are in charge: With the right leadership, the right strategy, the right combination of revolutionaries and organic working-class militants, the case of the Minneapolis truckers shows that real working-class power is more than a pipe dream. In scientific terms, it provides a proof of concept. In psychological terms, it provides a reason to keep fighting. Understanding why the Minneapolis truckers’ strikes succeeded therefore remains more than an academic exercise. It offers valuable lessons for building a powerful working-class movement. This is particularly the case for those who identify with the Trotskyist tradition, but it also holds more generally for those who seek to build a stronger and broader labor Left…read the full article here. Bryan Palmer’s exuberant 300-page book immediately takes its place among the essential works about 1930s radicalism in the United States. Revolutionary Teamsters is no nostalgic chronicle of sepia-tinted events, much less a sentimental tryst with the revolutionary past. Using artful, stirring, and formidable research, Palmer puts pen to paper (or is it finger to keyboard?) with a moral urgency that vividly raises the political stakes in the field of labour studies. Even in the context of the author’s own sizeable and distinguished Marxist oeuvre spanning thirty-five years, it shapes up as a standout through its pertinence to contemporary activism: “Minneapolis in 1934 matters because, in 2013, it has things to tell us, ways of showing that the tides of history, even in times that seem to flow against change, can be put on a different course.” His sources are examined from every possible angle to produce a work radiant with the achievements of singular protagonists, men and women aflame with world-transforming convictions. We now have the richly detailed account that the militants of the International Brotherhood of Teamsters in Minneapolis deserve, as well as a brilliant rebuke to the forgetting of history…read the full article here.